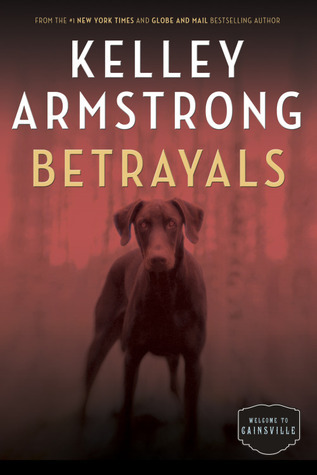 Disloyalty and danger around every corner, Kelley Armstrong’s Betrayals will have readers at the edge of their seats with this highly intense and dark addition to the Cainsville series. When Ricky is charged with murder, the trio begin a quest to solve this mistake which ends up tying them to another supernatural mystery. Full of twists and unexpected discoveries, Betrayals will have readers unable to anticipate the outcome of events occurring in this thrilling addition to the series. Who is behind the killings Ricky’s been framed for? Will Olivia and the gang find out before the murderer finds them? When Olivia’s life exploded–after she found out she was not the adopted child of a privileged Chicago family but of a notorious pair of convicted serial killers–she found a refuge in the secluded but oddly welcoming town of Cainsville, Illinois. Working with Gabriel Walsh, a fiendishly successful criminal lawyer with links to the town, she discovered the truth about her parents’ crimes in an investigation that also revealed the darker forces at work in the place that had offered her a haven. As if that wasn’t enough, she also found out that she, Gabriel and her biker boyfriend Ricky were not caught in an ordinary sort of love triangle, but were hereditary actors in an ancient drama in which the elders of Cainsville and the mysterious Huntsmen who opposed them had a huge stake. Now someone is killing street kids in the city, and the police have tied Ricky to the crimes. Setting out with Gabriel’s help to clear Ricky’s name, Olivia once again finds her own life at risk. Soon the three are tangled in a web of betrayals that threatens their uneasy equilibrium and is pushing them toward a hard choice: either they fulfill their destinies by trusting each other and staying true to their real bonds, or they succumb to the extraordinary forces trying to win an eternal war by tearing them apart. After Deceptions, I wasn’t sure how I’d feel about Betrayals. Though the previous three books weren’t bad whatsoever, my opinions of them slowly lowered as the series progressed. If I actually decided to give half ratings, I would rate Betrayals as 3.5 cups of tea. Omens and Visions still surpass all the novels currently in the Cainsville series, yet Betrayals was a close runner up. With more focus on the Fae and Olivia’s visions, Armstrong’s fourth installment in the series bring some mental relief as she begins to provide more answers than questions for once…which I personally was stupendously ecstatic about. Betrayals is an extremely appropriate title for this novel…everyone’s just betraying everyone! While some acts are larger than others, this book deeply explores the concept of betrayal; how does one learn to trust and confide in others when you have NO idea WHO you can trust? Book titles that directly link to the central theme or concept of a novel are astounding, for it gives a larger and deeper meaning to the content and basically hints to readers what you should expect. As always, Armstrong continues to impress me. As Olivia and Gabriel continue their pursuit to solve the Valentine serial killings, Ricky’s accused of murder…of course, since the three musketeers can’t catch a break…EVER. The thrilling part is that the killings tie into the world of the Fae as Armstrong introduces a new kind of mythical being into the mix-up. What these creatures are? You’ll have to read it to find out! Similar to Deceptions, we gain an abundance of knowledge regarding the Fae and why the trio are so important to the Tylwyth Teg and Cwn Annwn, the war brewing between two supernatural groups. The love triangle was still a bit much for me, yet again. This is honestly the main reason my I can’t give this book 4 cups of tea; I’m NOT a fan of love triangles for I find them a nuisance and rather annoying. But as I stated in my review of Deceptions, the love triangle isn’t as bad as others that have appeared in different books I’ve read. Overall, the plot is fantastic…just not the love triangle. One thing I find truly remarkable about Armstrong’s writing (…among other things…) is the constant character development in her books. In her series, Armstrong pays a large amount of focus on adding something new to the characters; whether it’s a flaw or a positive addition, the characters have some sort of development in comparison to the previous novel. In Betrayals, the trio all grow in some manner. Furthermore, the key characters that represent the Tylwyth Teg and Cwn Annwn also develop, giving us a better picture of who they are and the reasons for how they act the way they do. Yes, I’m being rather vague, but I seriously don’t want to spoil anything. The person with the biggest progression in my opinion would be Gabriel; he’s slowly starting to come out of his shell and opening up to Olivia, Ricky, and his aunt Rose. Though he still hides behind his walls at points, he quickly comes back rather than staying far away for too long. His role in the battle of power between the Tylwyth Teg and Cwn Annwn is a great burden, one which he sincerely hates facing. Nevertheless, Gabriel’s character slowly starts to accept this role and know he’s not bound to it, such as Olivia and Ricky have already come to terms with. For those who love vibrantly descriptive texts, Betrayals is a book for you. In all the books I’ve read by Armstrong, I’ve noticed her great attention to detail and description. Since her stories tend to incorporate a lot of paranormal beings and intense scenes, it’s key that the language is both descriptive and comprehensive enough for the reader to understand. As usual, Armstrong did not fail in this regard. Betrayals is a fast-paced, highly addictive novel that will have readers eager to get their hands on the final chapter of the Cainsville series. As much as the love triangle caused strife with me, the remainder of the plot is so rich in content that it makes up for it. With amazing twists and greater character growth, Betrayals was an absolute delight to read and adds an abundance to the Cainsville series. If you’re a paranormal fan that loves a good surprise, this book and series is most definitely for you!